Do you have a guilty pleasure? Mine is watching ‘Desperate Housewives’. I love the drama dripping from every scene, the implausible yet gripping storylines, the dark humour underneath it all. What this now sadly defunct TV show really excelled at though was the depiction of the female friendships and rivalries. No matter what they did to each other, the pain and the happiness each one of the four main characters equally inflicted on the other three, Bree, Lynette, Susan and Gabrielle always remained friends in the grand scheme of things and were always there for one another on ‘Wisteria Lane’. I used to really admire this. Murder, body concealment, several fallouts over men, kids and finances. It didn’t matter! Those four ladies were tight friends and all other female characters in the series either contributed to the dynamics of their friendship or were fair game. It made for a compulsive viewing. 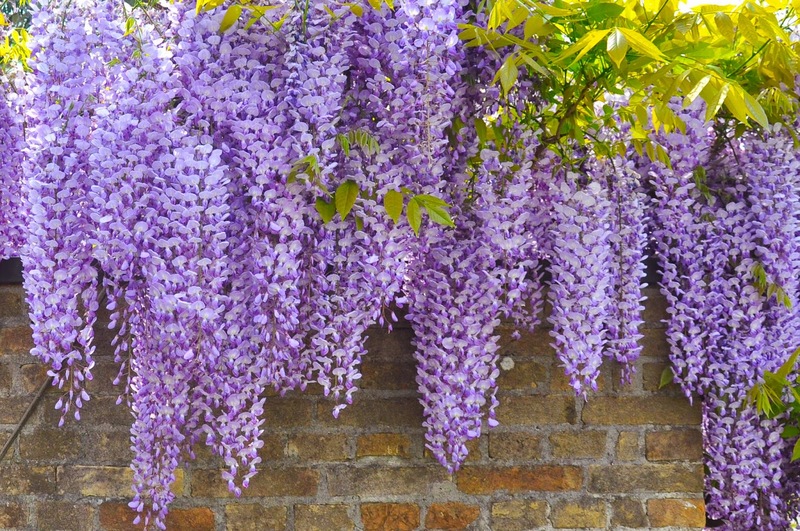 As it turns out, April is wisteria season here in Italy. Purple blooms drip from balconies, fully cover brick fences and hang from verdant canopies over our heads. I had never seen a wisteria bush in real life before. I was taken a bit by surprise by how ubiquitous wisterias are here. Until now in my mind they seemed to have existed only on that famous lane. 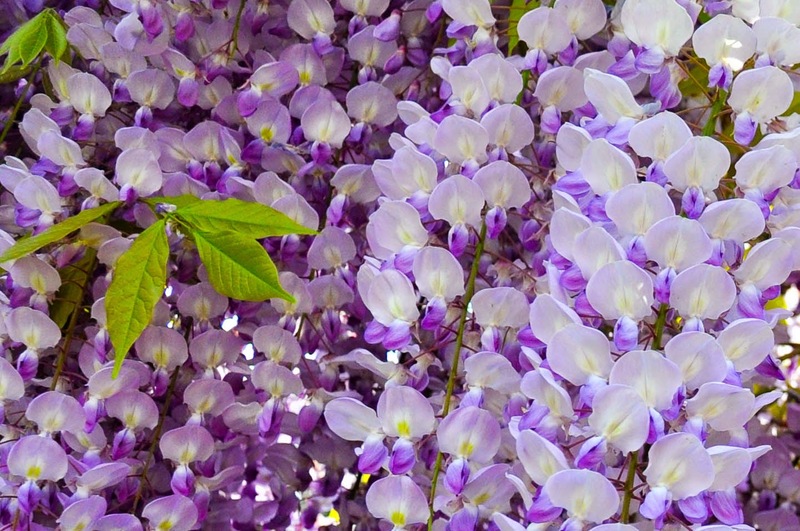 And secretly, inside myself, I used to be convinced that wisterias got picked for TV fame not just because they are visually stunning, but mainly because their name phonetically is so close to the term for an emotional condition most people still identify mainly with women, i.e ‘hysteria’. So, blooming wisterias are everywhere around us at the moment and I made a little discovery about them. They not only look gorgeous with their cascading purple petals, but they are also very fragrant. It is a shame their blooms, apparently, only last a very limited amount of time. This is why when I see a wisteria now, I always try to stop and admire it for a while. I have noticed that, perhaps provoked by the reference to ‘Desperate Housewives’, my wisteria encounters always make me think of the female friendships in my life. And the more I think, the more I see that the implausible storylines of the TV show were not that far-fetched after all. We, women, have this uncanny ability to weave some very dramatic friendships with each other, which can turn into frost at the drop of a hat. We can be very close, closer than sisters by birth, and then turn on each other with a vengeance or, even worse, with a surreptitious desire to harm. And, then again, there are the girls who you have never been really that close to and then, bang, right when you need a helping hand, they are there by your side. I had a close University friend who stole from me. Another friend who wanted us to share a flat together and right when we were about to sign on the dots, told me that she expected me to ‘make myself scarce’ and sleep some place else on weekends and at Christmas when she was going to have her boyfriend round. But then I have a friend who always makes time for me and even though sometimes we don’t email each other for weeks and months, it is always easy to pick the thread of that friendship and start weaving it again. Glimpses of these stories and several others keep popping in my head every time a flowering wisteria comes across my way. And then the questions start: When the time comes, what should I teach my daughter about female friendships? What is the value of female friendships and how it measures to the value of your family and your career plans? Can women be real friends with one another or is this valid only if they have nothing to be envious of in the other one? Answers are not difficult to come with. What I find difficult at times is that the answers often change depending on where you are in life and how disappointed or elated a particular female friendship has made you feel. However, there is one thing I am sure of. The less desperate you are for someone to be your friend, there is a bigger chance that you will be more authentic in the relationship and more able to see things and people for what they are. I am sending a purple wisteria bloom to every girl and woman who have been my friend at some point in my life. We can’t pick our parents, but we can pick our friends and sometimes our choices give us all the answers that we need about ourselves and the value we feel we have.